As you plan your crops this year, think about what your family likes to eat and how much produce you will use. 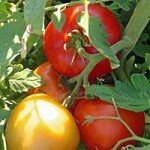 Cherry tomatoes grown in a container are an easy snack for kids and adults. You can also extend your tomato season by starting with early varieties like Early Girl and adding later producing heirlooms such as Brandywine. Tomatoes love water, but do best when watered at the soil level so moisture doesn’t collect on the leaves, attracting fungus. Consider adding companion plants such as basil, marigold, chives, and bee balm to your garden as they improve the growth and flavor of tomatoes.